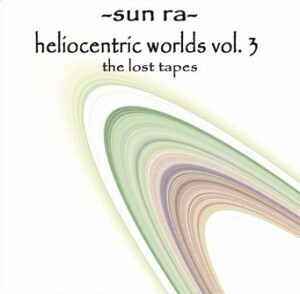 Sun Ra - "Helio Centric Worlds Vols. 1 & 2" / "Heliocentric Worlds Vol. 3: The Lost Tapes"
ESP has been busy re-issuing a number of their classic 60's releases, as well as some new material. Of interest to free improvisation and cosmic jazz fans is the re-issue of Sun Ra's groundbreaking mid-60's Heliocentric Worlds sessions. Originally released on two separate LP's (and still available as two separate CD's), ESP has also put them together on one CD for their most current re-issue. The 50's found Sun Ra and his band playing more or less traditional be-bop and jazz, but Ra was starting to push the boundaries, experimenting with primitive electronics and other unusual instruments, whilst incorporating themes of outer space, ancient Egypt and African history into his music. But it was in the 60's, when the rock world was exploding with the new psychedelic sounds, that Sun Ra really began to explore outwards into realms of free jazz improvisation, something he called "space jazz". Classic mid to late 60's avant-garde efforts like Atlantis and The Magic City are essentials amongst Sun Ra's canon, and represent some of the finest, and most adventurous free jazz ever recorded. 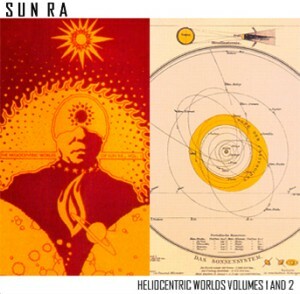 Prior to these two legendary albums, Sun Ra recorded the equally legendary Heliocentric Worlds albums. The Heliocentric Worlds of Sun Ra Volume 1, released originally in 1965, opens with Heliocentric, defining many themes that would run through the rest of the album. Sparse areas of space are juxtaposed with cinematic squalls of brass, accents of flute, and thundering timpani. Ra himself contributes tumbles of bass marimba, lending a nice feel of futuristic primativism to both this and Outer Nothingness. On the frenetic Other Worlds, a space storm of brass and percussion collides with Ra's percussive style piano playing, taking the listener to the edge of chaos without quite spilling over into it. The Cosmos is an amazing, complex journey into deep space textures, with scintillating cymbal percussion and deep, rolling timpani underlying urgent bowed bass, and Ra's shimmering electronic celeste, which alternates with cascades of acoustic piano and swirls of distant, crazy brass. Of Heavenly Things is all about percussion as chimes, woodblocks, timpani, drums and Ra's bass marimba shuffle along to a walking bass-line, while twittering flute and liquid brass drift in an out of the mix. The electronic celeste makes a return on the shimmering, starry sky opus of Nebulae, and things end with the short but infectious be-bop romp of Dancing in the Sun. While Volume 1's pieces were largely shorter explorations, on The Heliocentric Worlds of Sun Ra Volume 2, Ra and his Solar Arkestra stretch out and really explore. Recorded on a different day, nearly 7 months after its predecessor, with a somewhat different line-up of instruments, Vol. 2 trades Vol. 1's more subdued approach for a generally louder, more extroverted excursion. Things get underway with the mournful, bowed bass and wild, untamed percussion of the nearly 18-minute long The Sun Myth. As the exploration continues, deep piano rumbles and crazy high-end brass swirls in spinning vortices through swells of deeper brass, building to climaxes, falling off into spacious emptiness, forming into rhythmic passages that then dissolve into free form chaos again. Finally the piece eases into deep, organic bass tones, quieter cymbal crashes and slow, mysterious and spacey swells of brass to finish things off. A House of Beauty is the only shorter piece on the album, but still manages to range from a free form beginning of shrieking piccolo and stabbing bass to almost ballad style piano jazz and back again. The nearly 15-minute long Cosmic Chaos is a dazzling free form workout, although this is not totally free form. Under Sun Ra's guidance, the Arkestra were masters of emergent rhythms, tying together explosive freak-outs to quieter solo sections with seductively rhythmic passages. Ra also utilizes reverb effects on this one to create some truly cosmic stretches of sound through the middle, with weird, spacey jangling percussion punctuated with dry and bouncing tuned bongos. Truly cosmic jazz! Nearly 40 years after the original release of The Heliocentric Worlds records, tapes from the same recording sessions as Volume 2 were discovered, re-mastered and packaged as Heliocentric Worlds Vol. 3: The Lost Tapes. Things kick off on this disc with the 17-minute Intercosmosis, with waves of piano and squawking sax taking the lead before the whole band joins in after nearly 6 minutes. Ra's piano weaves its way in and out through the entire piece, mostly in a thunderous percussive style, but sliding into more lyrical passages towards the end, while percussion and brass rise and fall through various sections. Mythology Metamorphosis is a rollicking percussion piece that sounds a little more like the Vol. 1 sessions. Heliocentric Worlds, a "title track" of sorts, is filled with great cymbal swells and gentle piano breaks. World Worlds is almost traditional jazz, with it's loping swing-style rhythm and melodic solos. In direct contrast is the album closer, Interplanetary Travelers: a dense, wall of sound freak-out. Of the three albums, my favourite is Vol. 2., but then I love those long, extended voyages, and I find The Sun Myth and Cosmic Chaos to be a little more creative and evocative than the lengthy Intercosmosis on Vol. 3. Volume 1 was perhaps the more innovative of the sessions, with its unique combination of instruments and focus on sonic textures. Alas, Vol. 3 doesn't quite match up to the excitement of the two previous volumes. One wonders why it languished on a shelf for nearly 40 years. Perhaps Sun Ra himself felt these tracks were not as engaging as the ones that were originally released. Then again, Sun Ra and his Arkestra embarked on a six concert series in various colleges around this time, all of which were recorded, but he turned only one album's worth of material over to ESP (the album that would become Nothing Is). Obviously Ra held onto the rest for a reason. Since he has left this world to return to his native Saturn, we will never truly know whether Ra would have wanted this third volume in his Heliocentric Worlds series released or not, but it's worth picking up for seasoned fans and collectors, if just to have some more insight into a historic recording session. I wouldn't call it a necessary acquisition for the casual Sun Ra listener. Vols. 1 and 2, however, are beyond essential. In its time, the music of Heliocentric Worlds was truly groundbreaking and influential, not just in the realms of jazz, but in other genres as well. Students of film music will hear some of the ideas that Ra developed cropping up later in some of the science fiction film scores of the late 60's and early 70's, and of course, Ra's outer space explorations inspired the psychedelic era artists to push the boundaries of rock into more free form and experimental directions, giving birth to that thing we call space rock. For more information, visit: http://www.espdisk.com.